My mother is a strong woman who has always been self sufficient. Her tenacity is admirable. Her will to thrive is beyond measure, she takes sass from no one and she is a unashamed woman of God. After becoming a mother I found myself always remembering her quotes or telling the kids things she used to say to me. I tend to get upset about things the way she did. I don't give up on things easily, also something I learned from her. I started thinking the other day how I have learned so much from my mother and how I hope someday when she passes, my sisters and I can fill her shoes at least half way. 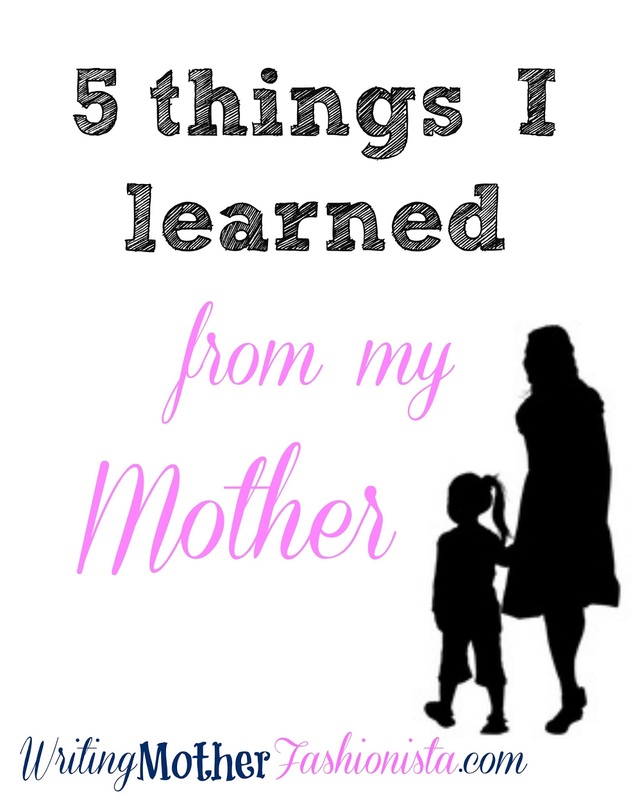 I want to share my 5 things I've learned from my mother with you. 1. Always wash your face and brush your teeth before bed. Now this is a given, but you'd be surprised how many times I've wanted to just crawl in bed with my makeup still on my face after a long day! I'll lay down and remember my mom actually asking if I've washed my face and brushed my teeth already. Come on ladies you know makeup can clog your pores, give you wrinkles, make your face super oily. Just wash it! And take care of your teeth! I don't mean to brag but I get compliments on my teeth a lot! I drink coffee but my teeth are not stained or chipped nor have I had a cavity since I was like 8. Brush, floss, mouthwash. Just do it! 2. Your yes be yes and your no be no! My mom always used to say this to me. Be confident in your decisions. Don't be afraid of success or failure. You learn from both. Don't teeter totter on your choices. If you know you have made a wise decision about something, don't let someone come along and change your mind. My mom always used to say the scent of a woman should be 1 and it should be memorable. This may sound a bit weird, but when I used to snuggle my mom she had a scent. I don't know if it was her natural scent or her perfume, but I loved it. When I moved away I missed her scent. Her scent felt like home to me. Now that I am married, my husband hugs me and says "I love your scent." Make your scent memorable to those you love. Make your scent feel like home. I hope this makes sense! One thing I always admired from my mother was her self love. She never needed validation from anyone. She walked confidently, with her head held high and her shoulders back. If someone didn't like her or her attitude she would say, "That's ok because I love me and God loves me." It took me a while to learn this from her, but I finally feel I have gotten to a great level of loving myself. This is the most important lesson learned from my mother. Come rain, shine, thunder, lightning my mother loves God. She loves him like no other. She has always put her faith in him and he has always provided for her. In my life I have seen him work miracles so many times. Times when I thought I was at my lowest God came in and lifted me up. After becoming a mom myself, I had no clue what to do with my kids. There is no manual on parenting. You have to figure it out as you go. However, I know that even if I screw up everything else, they will believe in God. They will love God. My kids will know the miracles that God has done in our family. To love God is the best legacy my mother has left me and I will leave to my kids. These are only a few things I chose to share today, but we all learn from our mothers. Make sure to take the time to thank them for those lessons learned. Just like us they are hoping they did something right. What's the best thing you've learned from your mother? Share in the comments below! Mi madre y yo no siempre hemos visto ojo a ojo. De hecho, de chica yo era una " niña de papá " gigante! Siempre sentí que él me entendía un poco más que mi madre. Como adulto me di cuenta que era de esa manera porque mi madre y yo somos muy parecidas. Pensé, como muchos niños, que algún día me daría dolor admitirlo, pero ahora realmente me da orgullo admitirlo. Soy la hija de mi madre. Mi madre es una mujer fuerte que siempre ha sido autosuficiente. Su tenacidad es admirable. Su voluntad de prosperar es sin medida, ella toma malas actitudes de nadie y ella es una mujer sin vergüenza de ser hija de Dios. Después de convertirme en una madre me encontré recordando siempre sus dichos o les digo a los niños cosas que ella solía decirme a mí. Me tiendo a molestar por cosas de las que se molestaba ella. No me rindo fácilmente, algo que también aprendí de ella. Empecé a pensar el otro día cómo he aprendido mucho de mi madre y cómo espero que algún día, cuando ella pase a mejor vida, mis hermanas y yo podamos llenar sus zapatos, al menos, la mitad. 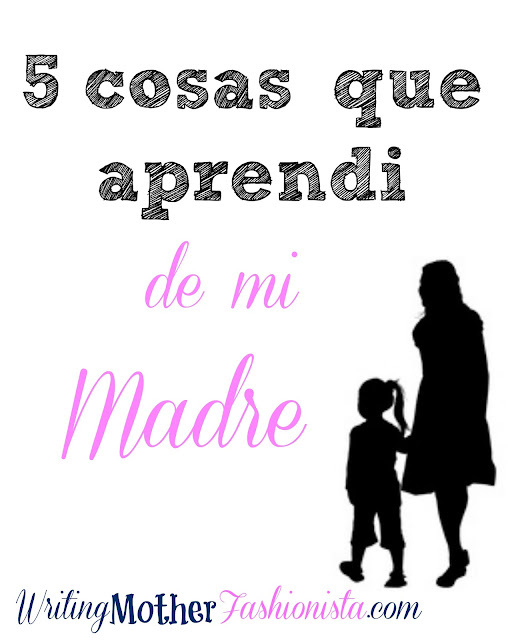 Quiero compartirles 5 cosas que he aprendido de mi madre. 1. Siempre lávate la cara y los dientes antes de acostarte. Bueno, este es un hecho, pero te sorprendería la cantidad de veces que he querido simplemente meterme en la cama con mi maquillaje todavía en mi cara después de un largo día! Me recuesto y recuerdo a mi madre en realidad preguntándome si ya me he lavado la cara y los dientes. Vamos señoritas que sabemos que el maquillaje puede obstruir los poros, nos dará arrugas, hace la cara muy grasosa. Sólo lavensela! Y cuiden de sus dientes! No quiero presumir, pero agarro muchos piropos de los dientes. Tomo café, pero mis dientes no están manchados o astillados ni he tenido una cavidad desde que tenía 8 años. Cepillo, hilo dental, enjuague bucal. ¡Solo hazlo! 2. Que tu sí sea sí y tú no sea no! Mi madre siempre me decía esa frase. Ten confianza en tus decisiones. No tengas miedo de éxito o fracaso. Se aprende de ambos. No tambalees en tus opciones. Si sabes que has tomado una sabia decisión sobre algo, no dejes que alguien venga y te cambie de opinión. Mi madre siempre solía decir el olor de una mujer debe ser 1 y debe ser memorable. Esto puede sonar un poco raro, pero cuando me gustaba arrullar mi madre tenía un olor. No sé si era su aroma natural o su perfume, pero me encantaba. Cuando me mudé echaba de menos su olor. Su olor se sentía como un hogar para mí. Ahora que estoy casada, mi marido me abraza y dice: "Me encanta su olor." Haga su aroma memorable a sus seres queridos. Que su aroma se sienta como en casa. ¡Espero que esto tenga sentido! Una cosa que siempre admiré de mi madre era su amor propio. Ella nunca necesita la validación de cualquier persona. Caminó con confianza, con la cabeza alta y los hombros hacia atrás. Si a alguien no le gustaba ella o su actitud diría, "Eso está bien porque yo me amo y me ama Dios." Me tomó un tiempo para aprender esto de ella, pero al final me siento que he llegado a un gran nivel de amor propio. Esta es la lección más importante de mi madre. Si llueve, nieva, truena, relampaguea mi madre ama a Dios. Ella lo ama como ningún otro. Ella siempre ha puesto su fe en él y él siempre ha proveído para ella. En mi vida he visto milagros de Dios tantas veces. Momentos en los que me vi tan baja pero Dios entró y me levanto. Después de convertirme en una madre, no tenía ni idea de qué hacer con mis hijos. No hay un manual sobre la crianza. Uno tiene que entender a medida que avanza. Sin embargo, sé que incluso si meto la pata en todo lo demás, van a creer en Dios mis hijos. Ellos van a amar a Dios. Mis hijos sabrán los milagros que Dios ha hecho en nuestra familia. Amar a Dios es el mejor legado que mi madre me ha dejado y dejaré a mis hijos. Estas son solo algunas cosas que elegí para compartir hoy, pero todos aprendemos de nuestras madres. Asegúrese de tomar el tiempo para darles las gracias por las lecciones aprendidas. Al igual que nosotros, están esperando saber qué hicieron algo bien. ¿Cuál es la mejor cosa que has aprendido de tu madre? Comparte en los comentarios abajo! Love this post! Especially the idea of having a 'scent' I don't know if it is a mix of shampoo/perfume/or what, but it's nice to have a familiar home smell, isn't it? Yes. The scent of a woman should always feel like home! I love this post, and I love the picture of you and your mom. Beautiful ladies! My mom is definitely my best friend, and I hope to be as good a mother some day. Your mom sounds like a very wise woman with some great advice. Thanks Shann. She really is! This is a great post. 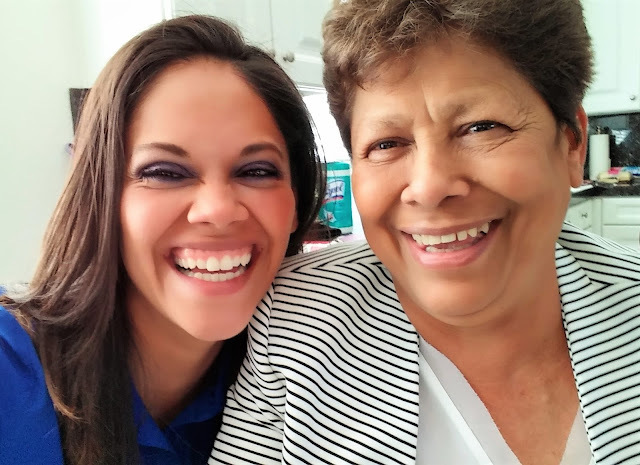 You have me over here thinking about all of the things I've learned from my mother. I never even thought about picking a "scent' - now, that's what I want to do! Thanks for sharing, Dominique! Thanks for reading Erin. You're the best! What an absolutely beautiful post!! Love yourself, love God!! SO MUCH YES! Awe thank you so much! Yes loving God is so important in my life. Your mom sounds like an amazing woman! You are lucky to have these memories from her. She really is. Thanks so much for stopping by!